The full and final version of iOS 9.1 Firmware (Build: 13B143), Xcode 7.1 Software (Build: 7B91b), WatchOS 2.0.1 (Build: 13S428) and tvOS GM (Build: 13T396) has been officially released by Apple with the addition of several new features and functionalities. Apple iOS smartphone and tablet device users can upgrade and install the latest available firmware update via OTA (Over-the-Air) and via iTunes restore option manually. The official Direct Download Links of iOS 9.1 .IPSW Firmware Files for iPhone 6S Plus, iPhone 6S, iPhone 6 Plus, iPhone 6, iPhone 5S, iPhone 5C, iPhone 5, iPhone 4S, iPod Touch 6G , iPod Touch 5G, iPad Pro, iPad Air 2, iPad Air, iPad 4, iPad 3, iPad 2, iPad Mini 4, iPad Mini 3, iPad Mini 2, iPad Mini and Apple TV 4 is also available now. What's New in iOS 9.1 Changelog? 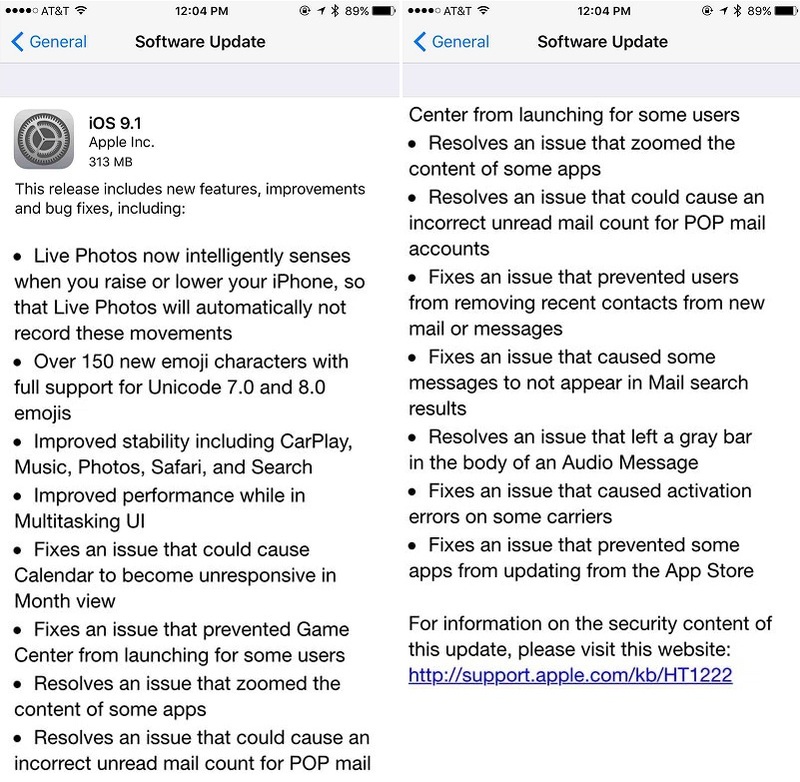 Apple iOS 9.1 Update includes new features, improvements and bug fixes. More you can read in image below! What's New in Xcode 7.1 Changelog? The latest Xcode 7.1 supports Swift 2.1 programming language, iOS 9.1 SDK, watchOS 2 SDK, tvOS SDK, and OS X 10.11 El Capitan SDK. What's New in WatchOS 2.0.1 Changelog? 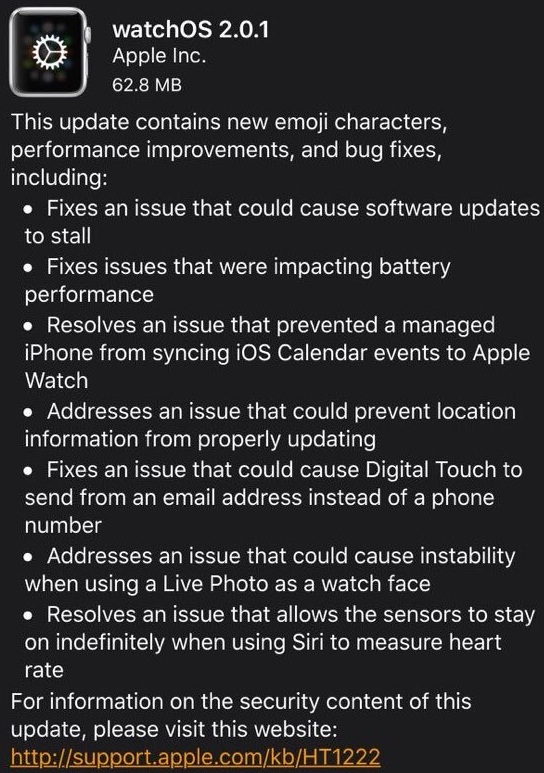 You can find all new WatchOS 2.0.1 changes in below image! How to Jailbreak iOS 9.1 Firmware? Apple has restricted iOS 9 Jailbreaking upto iOS 9.0 / iOS 9.0.1 / iOS 9.0.2 firmware's, with the introduction of iOS 9.1 Firmware, which has patched almost all exploits required to Untethered Jailbreak iOS 9.x.x Using PanGu, TaiG or 25PP Jailbreak Tools. How to Install iOS 9.1 Manually? For iOS 9.1 OTA Update, users can navigate to Settings > General > Software Update option of any iPhone, iPad and iPod Touch, whereas for Apple WatchOS 2.0.1 OTA Update, users can head-over to a dedicated Watch App on iOS device, through My Watch > General > Software Update. Apple iDevice users can also Download iOS 9.1 IPSW for Manual Fresh Installation Using iTunes restore option.